This guide assumes that you are familiar with keywords, the concepts, terminology and metrics that describe them and we also assume some knowledge of AdWords. You will need an active AdWords account targeting relevant keywords, to perform this type of keyword research. There are many techniques and types of keyword research that can each play a different or complimentary role in the ongoing endeavour to find new valuable keyword. We cover a range of common techniques for performing keyword research in this and other guides in this series. This guide looks at pulling data from Google AdWords to help inform your SEO strategy. Search volume is a metric that Google’s Keyword Planner provides with keyword to indicate the amount of people who search for a keyword (as a monthly average). This metric is notoriously inaccurate and some studies have shown a truly massive discrepancy between what we are told and what we see. Since Google starting restricting keyword data in Google Analytics quite a while ago, since then it’s not possible to see how much organic traffic each keyword delivers to your site. This is a problem because the value of a keyword is largely determined by how many people search for it. All other factors being equal, this is typically this most significant factor when choosing your keywords. Impressions is the number of times your ad has been triggered by a search query in Google, and Impression Share is; this number as a percentage of all the available impressions. This means that if you had 1,000 impressions and an impression share of 10%, you missed 90% of the available impressions. However, the beauty of this is that if we divide Impressions by Impression Share we get the total amount of available impressions, which is the actual search volume. There is a significant amount of potential crossover and synergy to be had from aligning your SEO and SEM strategies. Although than can end up competing against one another, there is no reason why they should. 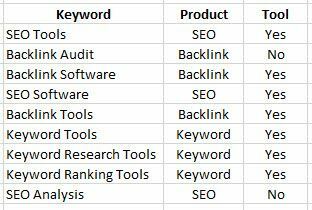 Even this basic keyword research exercise can help you learn something about both channels, that could result in increased efficiencies. We cover this concept in a little more detail later, with practical examples later in this guide. There are several places and ways to export valuable data to inform your organic keyword strategy, we cover these in the processes described below. 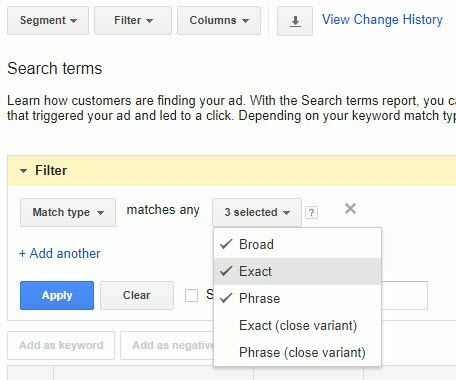 We will not be looking at the search terms for exact match keywords in this process as those keywords do not trigger significantly different search terms. All of the above match types will allow ads to be triggered for search terms not being directly targeted. Part of the benefit of using these match types is to identify new search terms to pull into the account as target keywords, we are just using them for SEO. You cannot use the competitive metrics within the search term report section of AdWords, but you do get the impression data. Once you’ve setup the columns and chosen a date range, we would choose ‘all time’ just to get all of the available data, download the report to a CSV or Excel file. AdWords provides some basic functionality with which to label components of the account, such as ad groups, ads, campaigns, keywords, etc… If labels are being used (and in a logical way) you can use these and potentially avoid having to re-label everything. Often, we find that the labels in AdWords, although useful for reporting, often aren’t structured well enough to be used for this type of analysis. Depending on the size of the account, the length of time it’s been running and the number of categories you apply; you could have a lot of data in that spreadsheet. We recommend filtering out anything that you can at this point… use the labelling process to help remove these terms. It’s also worth noting that these terms might be worth adding into the AdWords account as negative keywords… If they are not relevant, odds are you don’t want to pay to show your ads when people search for them. You can discriminate in any way that you want with this data, you can remove search terms with small volumes of data or no conversions, etc. If you have a list of current target keywords, we would remove all keywords in that list from the list downloaded from AdWords. You already target these terms and hence don’t need to review them in this context, as we are trying to find new keywords. At this point you should have a more refined list and this would be a good time to pull in some ranking data for these keywords. This is valuable as it provides some idea of how well you rank for these terms what pages are listed. The rest of the analysis will be largely limited to manually reviewing the remaining data for relevant opportunities. The data itself will often indicate what is valuable; especially if you have revenue and conversion data. At this point, there is nothing left but to determine if / what keyword opportunities you would like to target as part of your SEO Keyword strategy. If you end up creating content to target these keywords or even if you optimise existing pages; you can use these as dedicated landing pages in your AdWords account… You can split out the search terms into their own ad groups, using your newly optimised pages as the Final URL. If the SEO and PPC is managed by the same person or agency, odds are there is already some collaborative work underway, this might mean that there isn’t a huge amount of opportunities… Because the process for identifying opportunities is largely exactly the same as the process described above, we will focus more on the search volume data components. The search volume component is valuable because it provides us with some valuable data about our target keywords; this can be used in any other type of keyword research or analysis as the search volume data. The first step is to select ‘Search’ campaigns is there are other types available, then navigate to your keywords. We want to look at all of the keywords regardless of match type. *If your account receives a very small amount of the available impressions, you may see “<10%” instead of an actual value; in this case you will either need to assume a value like 9% or ignore these keywords. You can do this in a CSV file; simply divide the impressions by the impression share for each keyword. This will give you the search volume for the whole period (date range) that you exported; calculate the number of days, weeks or months I the date range and dive the resulting search volume by this number to get an average.